9:30 am on a sunny Saturday, the 23rd of April 2011. 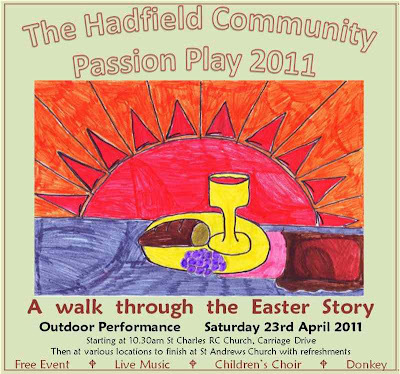 People are gathering to start the first ever Hadfield ecumenical Passion Play. The brainchild of Caroline Phillips from Hadfield's Methodist Church, it has been a collaboration between the Roman Catholic, Anglican and Methodist churches in Hadfield, Derbyshire. The idea was mooted about a year ago, and now, after weeks of rehearsals, costume making and preparation, everything is ready. 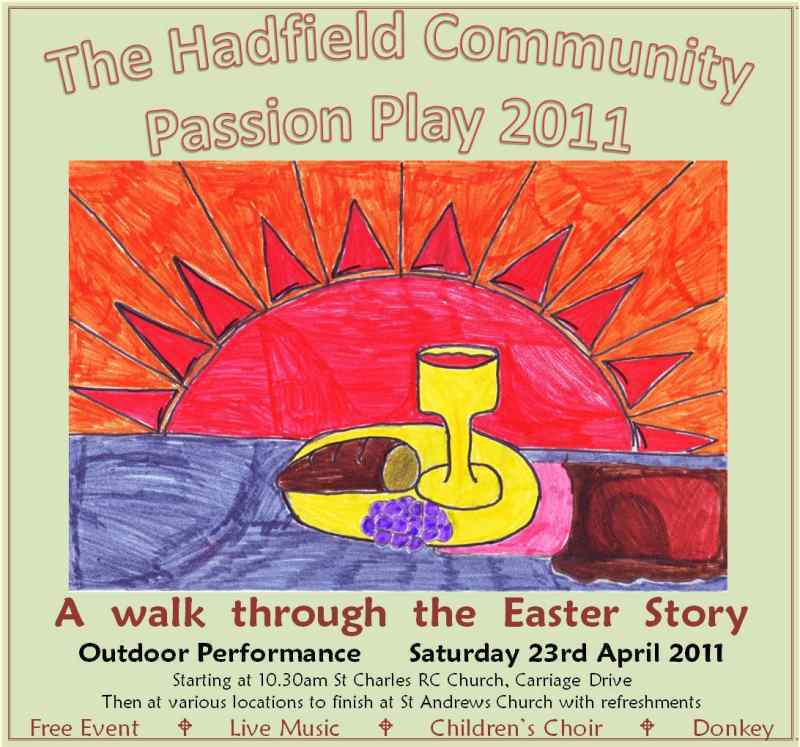 Our play has been well advertised too: St Charles and St Andrews Primary Schools both ran competitions for paintings of the Easter theme, and we used the wonderful paintings for our posters (there were about 20 different posters produced). The actors have all arrived and are changing into their costumes. They are of all ages from young teenagers to young at heart seventy somethings. Even the Peggy the donkey was there (from the Donkey Sanctuary at Buxton). The musicians gather; mostly the talented young people from St Charles RC Church, but there are a few from the Methodist church as well, and our cornet player is from St Andrews Anglican church. The audience starts to arrive as well and Caroline moves around, costumes over her arm, asking the children if they want to wear some and have some musical instruments (tamborines, etc.) 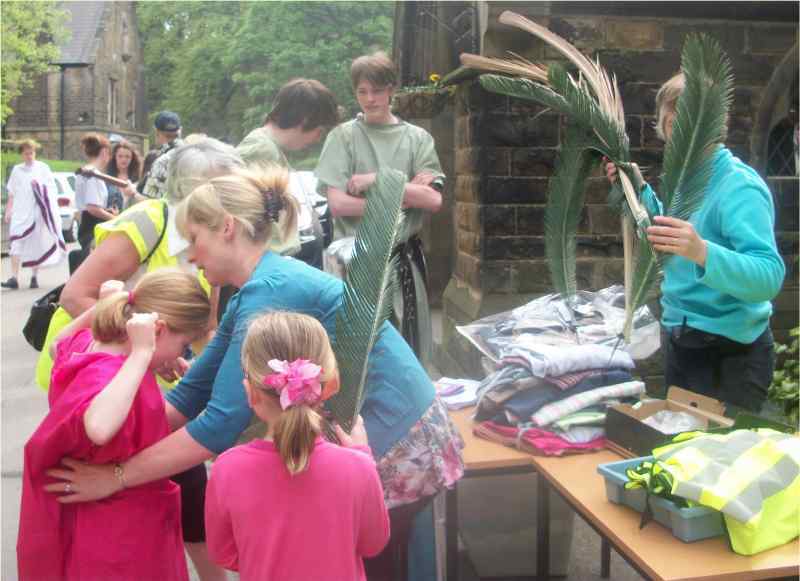 and palm leaves to wave. Several take up the offer with great enthusiasm.